Everyone’s story starts somewhere. Ours began in 1848. It’s a 169-year story that includes a real man named Henry Potter Burt and a fictional boy named Harry Potter. It’s a tale of agility, caring and innovation that Domtar is proud to tell. Dominion Tar and Chemical Company Ltd. In early 1848, Henry Potter Burt founded Burt Boulton Holdings Limited in England. The company specialized in treating lumber to prevent it from decaying. His business boomed as demand for railway ties and wharf pilings grew in Europe and in North America. This steady growth led to the founding of a new company, Dominion Tar and Chemical Company Ltd., in 1903. Dominion Tar’s first venture was a coal tar distillation plant in Nova Scotia. As Canada’s economy industrialized, the plant produced more products, and the company grew rapidly. Shortly after World War I began in 1914, Dominion Tar established its head office in Montreal, Quebec. In 1929, it was incorporated as a Canadian company and shares in it were offered for public sale. Over the years, Dominion Tar would become one of Canada’s largest companies; its widely diverse business interests included chemicals, consumer products, construction materials, kraft and fine paper, newsprint, containerboard and packaging. In 1965, Dominion Tar and Chemical Company, Ltd. became known as Domtar Ltd. In 1977, sales in the company passed 1 billion Canadian dollars for the first time, and the company continued operating as Domtar, Inc. In the 1990s, Domtar made pulp and paper its core business and grew through acquisitions in the United States and Canada. In 2007, Domtar combined its operations with the fine paper business of Weyerhaeuser to form the Domtar Corporation, which became the largest integrated manufacturer and marketer of uncoated paper in North America and the second-largest in the world. Here’s where young Harry Potter appears: Many of J.K. Rowling’s Harry Potter books were printed on paper made at Domtar’s Johnsonburg Mill in Johnsonburg, Pennsylvania. Domtar, looking for innovative ways to build growing businesses, created its Personal Care division through multiple acquisitions and investments made between 2011 and 2016. The division manufactures absorbent hygiene products and sells and distributes them across the globe. It also provides much-needed diapers to families in need through diaper banks and other programs. From our humble beginnings in 19th-century England, Domtar now employs nearly 10,000 dedicated people around the world and is a proud member of the Fortune 500. The rest is not only history, but history in the making. 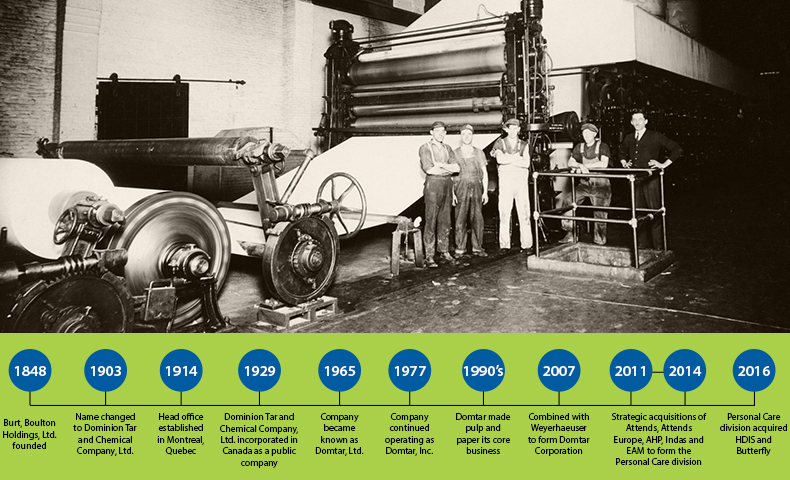 One thing has remained constant throughout Domtar’s 169-year story: our ability to remain relevant in an ever-changing industry. Our story is woven together by the guiding principles that ground us and keep us on the right path. They’re what drive us to improve lives by making products that everyday people around the world rely on. Our ability to unite as a caring and innovative team is the key to our success. Throughout our history, we’ve remained agile so we can meet the demands of an evolving world. Today, our spirit of innovation drives improvement, and our commitment to caring runs deep. We constantly look for better ways to serve our customers, support our employees and strengthen our communities. It’s the Domtar way.